After the end of World War Two, policymakers in London and across the Atlantic worried the Cyprus problem could unravel the entire Eastern Mediterranean. Following independence from the United Kingdom in 1960, tensions on the Mediterranean island flared between the Greek and Turkish communities residing there, inflaming tensions between new NATO allies, Turkey and Greece. There was considerable concern in the West that a deterioration of the situation could leave the door open for the Soviets to gain a foothold in the Mediterranean basin. In 1974, the Colonels’ Junta in Greece orchestrated the ouster of Greek Cypriot leader Patriarch Makarios III, prompting fears in Ankara that Athens was planning enosis, the union of Cyprus with Greece. In response, Turkish forces intervened immediately in 1974, landing more than 30,000 troops on the island before a ceasefire was declared three days later. Forty-five years later, the island remains divided despite years of intense negotiation, close calls, and extensive international engagement. The United Nations peacekeeping force on the island remains the longest such deployed UN force. With the end of the Cold War, the Eastern Mediterranean’s strategic value decreased, although lingering regional tensions remained. Over the last decade, however, the geopolitical situation in the region has changed materially, as Moscow has bolstered its position through its alliance with the brutal Syrian regime of Bashar al-Assad, rotating over 65,000 troops to the country and expanding its presence at Tartus, its only naval base on the Mediterranean. Moscow has now extended its access to Tartus by forty-nine years, gained access to other Syrian ports, and has indefinitely retained its presence at Hmeimim Air Base. 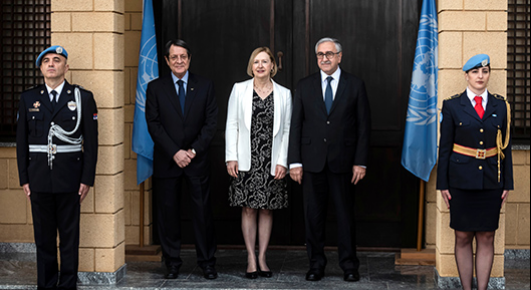 Furthermore, the waters around Cyprus have become a zone of concern regarding nonstate threats, including proliferation, organized crime, terrorism, human trafficking, and refugee flows. The divided island offers vulnerabilities that nefarious actors can exploit, as limited Cypriot security cooperation has led to unnecessary challenges. In 2014, Cypriot authorities scrambled to respond as an oil tanker hijacked by Libyan rebels headed toward the island. In a dramatic interdiction, US forces acted, supporting Cypriot authorities stretched beyond their means and limited by ad hoc measures. Brexit: Naked protesters invade Parliament & interrupt the debate!